Inis Oirr Boiler Stove The Inis Oirr boiler stove is a smaller yet very capable stove designed to heat the more compact home or to aid heating in larger sized homes. The Simple Elegant look of this Classical stove will compliment any room. Advanced clean burn technology means a considerable saving on fuel over standard stoves, thats right more heat for less fuel better for your pocket and the environment. In addition to this, the clean-burn air-wash also keeps the glass doors beautifully clear, giving you an uninterrupted view of the fire. Variety of colours available. Up to 10kw (35000 BTU) output Factory fitted, fully integrated wrap around heat exchanger Convection and Cleanburn system gives you increased effiency and reduced emissions. Airwash system ensures clean glass giving you uninterrupted view of the fire Single door stove Made from the best combination of 5 and 10mm plate steel, cast iron and ceramic glass Will heat up to 6 radiators and domestic hot water * Heat output to room is 4-5kw. Will heat a home up to 2000 square feet. 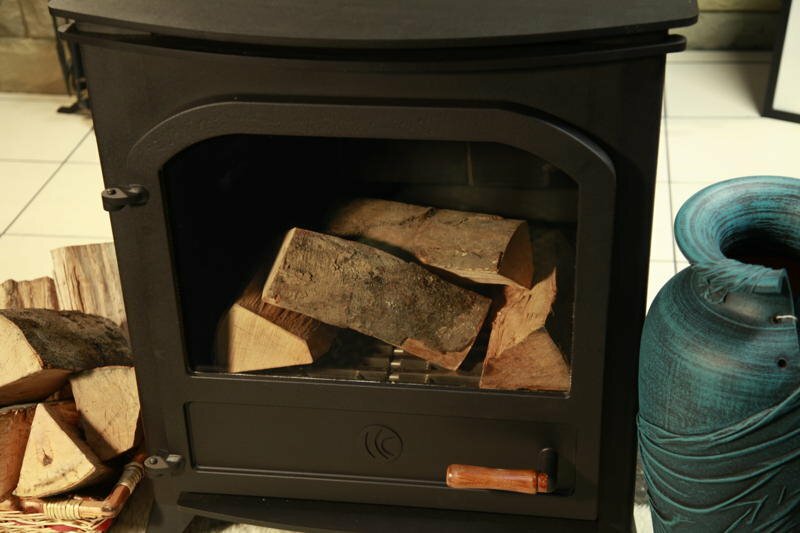 ** There is an outside air kit available for direct connection to the stove 6 inch Flue outlet, top and rear Over night burning capable, A wooden handle for safe and easy reloading Heavy duty Multi-fuel grate burns wood, smokeless coal, peat & eco fuels. Full external riddling mechanism makes stoking the fire much safer Fully controllable thermostatic damper for safer and easier operation. Removable ash pan. Variety of colours available including various colour handles. Full access to spare parts either on line or via all good stove stockists. Fully manufactured in Ireland to ISO9001-2000 standards Full 5 year guarantee. Fully guaranteed Irish. Spec Diagram Convection Air System “More Heat Less Fuel” All Inis stoves include a convection system, cool air from within the room is drawn into the convection chamber, the air is heated as it rises within the stove which then flows out into the room. The hot air rising draws in more cool air setting up a continuous flow maintaining added heating efficiency. * Based on a standard single radiator. ** Based on a averagely insulated home.